The world has become a very strange and unsettling place. Exhibit one is that a senior Tory Brexiter just now pulled out of being on my show tonight, because we didn’t have enough proper Leave-voting Brexiters on the programme. "The programme was startlingly unbalanced! Every guest but me having voted or campaigned for Remain," the Brexiter said. "I hope you can understand my concern at the lack of balance for one of the country’s top political programmes." Well actually I could not. Because this senior politician would have been interviewed at the start of the programme, in an impartial way, and with the space to express important arguments. And actually the other booked guests are various shades of Brexiter, even if I can’t be certain how many of them actually voted for Leave in the first instance. This decision to boycott Peston smacks of Eurosceptic McCarthyism, or the mistrust between Protestants and Catholics in Reformation England. The Brexit wars have come to this. It is also shooting-in-footism! Because in choosing not to appear on the show, by definition there is a risk the Brexiter voice will now be less well represented. Bonkers! Has Olly Robbins revealed Theresa May’s secret Brexit plan? Exhibit two, which presumably explains the paranoia of the Brexiters, is the way parliament is taking control of the process to leave the EU, and attempting to neuter the Prime Minister, in order to take the prospect of a no-deal Brexit off the table. 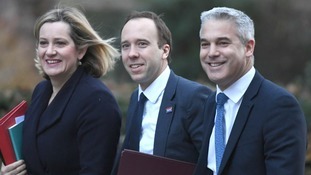 There is collaboration between senior Tory backbenchers (the Letwins, Boleses and Soameses) and the more Remainy members of the government (the Rudds, Gaukes, Clarkes and Hamondses) to ensure that on February 27, MPs would vote to start a process that would force the Prime Minister to ask for a delay to Brexit and simultaneously negotiate a framework for the future relationship between the UK and EU that most MPs could support. The aim would be to narrow the scope of the so-called Political Declaration on the permanent trading and security links between the UK and EU so that it probably ends up looking much more like the kind of supersoft Brexit that some have styled Common Market 2.0 and is not a million miles from Labour’s Brexit vision. And the idea would be to wrap all this up before the European Parliament is dissolved on April 18, so that the UK could actually Brexit shortly after. This is not the only possible outcome of delaying Brexit, but it is the most likely one now. Delay of course could lead to a much more lengthy renegotiation with the EU, leading to an eventual referendum. But the problem for the pure or ultra Brexiters, like my estranged guest, is that the cunning plan to delay Brexit would almost certainly deliver what they would see as Brexit in Name Only, and possibly no Brexit at all. It would be a betrayal, for them, of the referendum result to which they dedicated their entire souls. And for them the evidence of cancerous conspiracy against the One True Brexit goes wider still, in that ITV News' scoop of last night that the PM’s chief Brexit negotiator Olly Robbins expects MPs to be offered a choice in March of a reworked Brexit or a potentially long delay to leaving the EU proves to them (if proof were needed) that Whitehall is in on it too. What is striking of course is that there is an assumption among both proper Brexiters, soft Brexiters and Remainers that the PM is something of a bystander, that the UK’s Brexit fate is no longer in her hands. Here is the measure of her powerlessness. One senior Tory, who with other Conservative rebels wants to prevent a no-deal Brexit, said to me the PM should really thank them. "If parliament passes a law saying she has to ask for a Brexit delay, she is a law-abiding person and she will follow that law," said the MP. "And perhaps we are doing her a favour, because when she is following a law there is no choice for her." What the MP means is that in her duty to enact the will of parliament there would no longer be a conflict of loyalty for her, no more dilemma about whether to back soft-Brexit Tories or the Brexiter ultras of the European Research Group. In other words, she would not herself have to make the kind of Brexit decision that could split the Tory party. Of course the Conservative Party could just decide to break itself up of its own accord. And on the evidence before me, that looks increasingly likely.